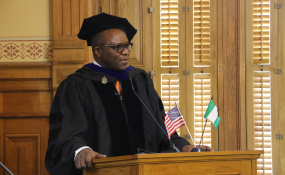 The Minister of State for Petroleum, Dr. Ibe Kachikwu has been conferred with multiple honours, including honorary citizenship of the State of Georgia in the United States. The event, which held at the Capitol Hill of the state in Atlanta, also featured the declaration of Oct. 25 as 'Emmanuel Kachikwu Day' by the State of South Carolina. Senatorial and Legislative hosts, the Black Caucus of the State Legislature, took turns to eulogise Kachikwu's "unimpeachable" reputation for integrity, intelligence, fairness and kindness. The legislators - Gloria Butler, Michael Rheft, Donzella James, Roger Bruce, Billy Mitchel, Howard Mosby, Erica Thomas, Sandra Scotts, Pam Stevenson, Jason Lary, and John King, also expressed pride at their African heritage. State of Georgia has the largest Black Caucus in the U.S. hosting 60 members, and is described as the 'heartbeat of African-Americans, with about 3.2 million black population. Dawkins Haigler, Chair Emeritus of the Black Caucus, and most of the other legislators, said they had done their ancestry tests, which confirmed that they were between 65 per cent and 85 per cent Nigerians. Responding to the awards, Kachikwu, who was visibly elated at the honours, said he was "extremely humbled" and dedicated the honours to President Muhammadu Buhari. "Usually I don't lack words but today, I think I do by the happenstance of today. I think the award is fantastic but what I think is more important is the symbolism of the awards. "The fact that citizens of the United States, especially our Black brothers and sisters, decided today to recognise a very humble nation that has nearly half of the population of Africa and commands the great economic heights of Africa and is bound to be the leader of tomorrow in the world. "That country is Nigeria; and for those of you who haven't been there, you should be there; you should be in a hurry to get there. You will attest to the fact that it is only a matter of time before Nigeria finds its feet and finds its own and become a power to recognise. "I thank President Muhammadu Buhari who gave me the opportunity to serve in various capacities that are bringing some of these awards today. Not only for his self belief but his determination as the leader to go outside the political mainstream and pick somebody he believed could help in the arduous task of trying to change the oil environment. "It is still work in progress; there's still a lot of work to be done but we're very committed. The problem with Nigeria isn't the disagreement that we have, it isn't the things that we have not achieved, it isn't the sometimes black sheep name that pervades all over the world about Nigeria, that is not the problem with Nigeria. "The problem of Nigeria is the unwillingness of the young and the old to forge collectively in a very transparent manner, to shake up what is vibrantly sleeping giant." Kachikwu said he was always very humbled to be called a Nigerian because "despite its challenges, it is the most wonderful place in the world to be in". The minister also said he was always proud to be called a 'minister' in the sense in that it was not different from an ordained pastor there to serve his people with a lot of transparency. "Quite frankly, I'm nothing more than a humble servant. And if there's something this President has achieved, it is the fact that ministers have become commonplace people, no longer the ego-strapped people to be celebrated. "So, today, the recognition that I get, I receive in honour of the President of the Federal Republic of Nigeria, President Muhammadu Buhari. Also, in honour of my colleagues who have worked very deeply with me and I think some of the things that we've achieved over the last three years, we didn't think were possible. "Into the next five years, I see a Nigeria where there will be power available for all nationals, where our refineries will work so we do not have to import petroleum products, where young people can set up businesses and do not need to know anybody in the system to be able to make that business grow. "A Nigeria where irrespective of where you come from - North, South, East and West - we will become brothers," he said. Among the dignitaries who attended the event were the Permanent Secretary of the ministry, Mrs. Folashade Yemi-Esan, Directors, heads of agencies of the ministry, Nigerian officials in the U.S., and members of the Nigerian community, among others.